I thought that yesterday’s post about my 3 encounters with the honeybee might interest you as to what I found the message to be for me. Perhaps you’ve had a visit from a honeybee as well, so I thought I’d share what I found from here. When the honey-bee spirit animal appears to you, it’s calling your attention to your everyday miracles. Just look at your honey-bee totem which is so small yet able to achieve so much. The honey-bee symbolism is also of community and teamwork. Use your talents to help humanity and make your personal contributions to change the world for the better. Add your voice to the collective consciousness. Raise the vibrations of the world you live in. Wow! Who knew the honeybee was such a powerful totem? And as I begin my next chapter into uncharted territory, I am grateful to that sweet little honeybee’s message. I love our community of bloggers and the friendships we have made. I am hoping now that we are transitioning into our new home, I can begin again to write, to read, to comment and to grow our community. 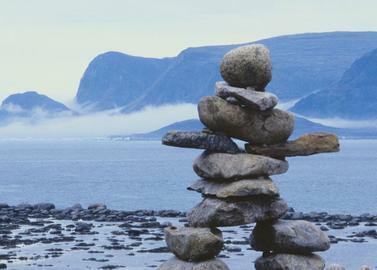 Please join me in raising the vibrations of the beautiful world we live in! It’s time to spread our wings, band together and fly like the darling honeybee! Daily Prompt ~ It’s Rocky Here! Depending upon the situation, I usually prefer to rely on myself for too many times I’ve been berated for being sad ~ even having been told that my personality had changed when my Dad died and I was left with the burdens that followed. To this day, that thoughtless comment has changed the way I feel about sharing and has caused me to pull away from those in whom I confided and trusted. I’m surrounded by well-meaning friends and family who sometimes just don’t get it and when I’m feeling that misunderstood, I simply hibernate until I can re-emerge the happy girl that they prefer ~ and they have shamelessly told me that they prefer the happy girl. What is it about being sad that bothers people, especially when there’s a death, a loss, an illness and many stressors involved? Is it proper to simply pretend all the time like they do? That all is honky dory instead of reality? Being that one dimensional is boring to me and quite utterly superficial. I’m not a proponent of being sad all the time, but I do allow myself to feel my feelings. I can’t help it. I am ME and I am not them. The older I get, the more I have moved away from such personalities. I find it hard to believe that being real and actually answering the ‘how are you?’ with a truthful answer, even couched with the positivity that I know things will get better, can be misconstrued to such a degree. Perhaps with those, it is better to simply say, ‘fine’ and move on as that’s how they’d prefer the answer. There’s no depth when we answer in a robotic manner when it’s truly not fine. Most of the time, I am ‘fine’ but I like to use more descriptive words ~ happy, healthy, blessed, feeling yippy skippy! (ok, I just made that up, but you get what I mean!) But I also know how to self-soothe and reach out when needed. You know that I love to connect with others, so if you need me, you know I’ll be there for you! I will hear the un-fine in the word fine and lend an ear, a hand and a heart! Literary Contest ~ Friday Deadline! What: In your best, most succinct writing – and in 100 words or less – tell us why you write. Dig deep. Why do you continue to put pen to page and what mark, through your craft, do you hope to make on the world? When: You have until 5:00 p.m. EST on Friday, April 26 to enter. 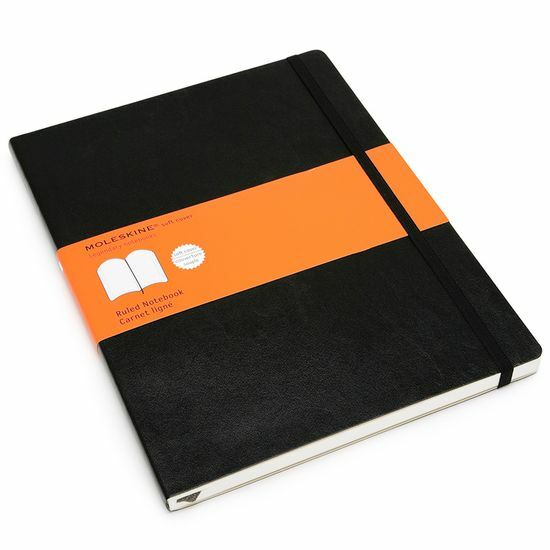 The Prize: Winner will receive one Moleskine Classic Extra Large Soft Cover ruled notebook (7.5 x 10). Picture above. Click the link to go to the contest. Best of luck! It might be fun to think about why you write! Let me know if you enter so that I can read your submission! Forgive the double posting today, but I wanted you to have enough time to enter if you wish! In the meantime, I thought this was a great card to begin the new year with ~ Don’t you love the optimism of this card ~ it has the ability to make you smile and to increase your desire to continue to SHINE ON! This is yet another year to shine for all of us! Are you ready? On your mark, get set and let’s Twinkle Sparkle Glow and Shine On this year! It’s only a matter of attitude ~ a shift if you will ~ and like any habit, it’s one that you can acquire easily without much extra effort…you just have to remember that you are a shining star. That’s it! You shine on with your attitude, your words, your expressions and by being yourself! Even the brightest stars may have days when we feel less than sparkly, but our light is always shining in our souls! 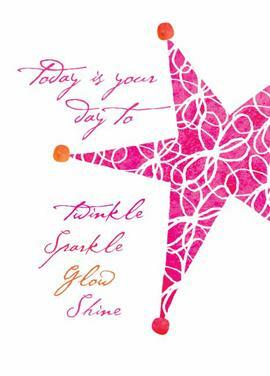 I would love to see us all twinkling, sparkling, glowing and shining this year! Imagine if as a connected community we allowed our inner lights to blossom and ignite the lights in others! We could be a fireball of enthusiastic bloggers who connect like the amazing twinkly lights of the New Year’s Ball in Times Square! Imagine the world cheering us on as we descend next New Year’s Eve on a year filled with every type of shining moment imaginable! Imagine the power of a community filled with love, light and individuals who’ve come together with enthusiasm, optimism and in inspiration!